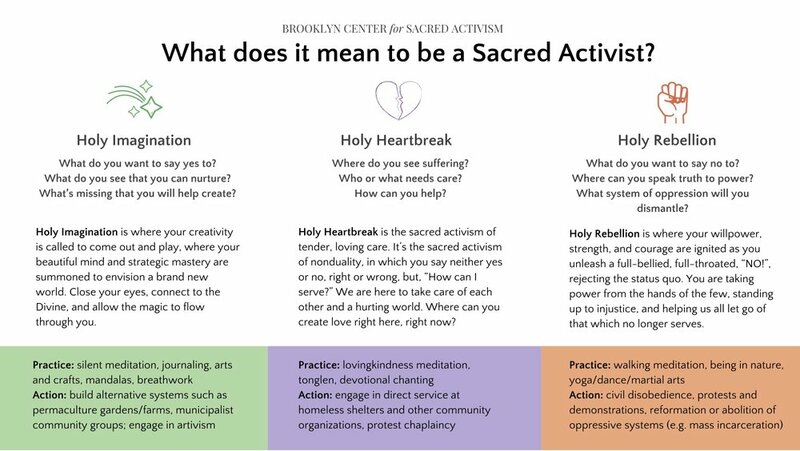 Brooklyn Center for Sacred Activism is a community of people who are dedicated to radical personal and social transformation. We are interfaith/no-faith/spiritual-but-not-religious seekers bound together by a shared commitment to making the world a better place, based on the understanding that working toward wholeness in the world and wholeness in ourselves are inseparable. Check out our new handbook for transformation! Do you want to get involved in radically healing our world, but don’t know where to start? Do you wonder how to be effective in your change work, while remaining holistic and spiritually-grounded? We co-wrote a handbook to help you live into these questions, both individually and in community! It’s free to download. Check it out! What does it mean to be a Sacred Activist? Sacred activism is a call for each of us to dedicate our full selves — mind, body, and heart — to the liberation of every creature on this planet. Not only do you have permission to bring your passions, skills, and desires to this path, but you are asked to as you discern your unique calling as a sacred activist. We are learning and practicing what it means integrate our spiritual lives and work for change. From the Poor People’s Campaign, to Standing Rock, to local NYC actions, we aim to be part of the shifting conversation toward a culture of social justice that is radically holistic, transformative, and spiritually-grounded. Community is at the core of what we do. There is no radical systemic transformation without radically transforming how we relate to one another, and without building, nurturing, and connecting radical communities. Not only is engaging in community a form of spiritual practice - a place in which we embody our interconnectedness, grow in self-awareness, and cultivate empathy for others - but, building community is itself one of the most powerful acts of resistance in a world where the powerful are dependent upon us staying atomized and numb. Our residential community is located in the neighborhood of Prospect Lefferts-Gardens. We regularly invite in and hold space for the wider community around us as well as reaches out to build relationships in a gentrifying neighborhood. We are active members of the local food coop, have led anti-racism trainings in partnership with MINKA, a local, POC-run healing space, and co-organize ANEW, an association for neighborhood empowerment. We strive to continue to transform the way urban communities live. Our extended community is full of amazing people - from zen teachers, to coders, to activists, to healers, to artists, to gardeners, to coaches, to parents, everyone comes with something different and unique. We host a 900+ book lending library of books on social change and spirituality. All of our books are catalogued online here. Over the last four years, we’ve opened our home to dozens of friends, travelers, and those in need of a quiet space to rest and renew. Leo Bierman is a co-founder of the Brooklyn Center for Sacred Activism, an interfaith minister, spiritual director, and an acupuncturist. He has received extensive formal training for over a decade in many of the world's spiritual and healing traditions, and now applies this knowledge to social change strategy. He currently runs a private and community acupuncture clinic in New York City, and through the Brooklyn Center for Sacred Activism he works to help move individuals, organizations, and institutions toward greater wisdom and compassion, and to improve their ability to create lasting, positive change. Co-founder Chelsea MacMillan and BCSA community member Rebekah Berndt host a podcast on spirituality and social justice. Check it out!